Innovation is more than just a trend; it has become a requirement for organizations that want to stay competitive in today’s economy. But many organizations struggle with developing strategies that will genuinely innovate the workplace and serve customers in new ways. Without innovative strategies, your company is likely to underserve its customers and experience lower customer satisfaction. How do we create an environment primed for innovation? How do we identify ways to innovate and drive change? How do we disrupt our traditional ways of thinking to keep in front of the competition? How do we keep our current customers happy while developing services that will entice new customers? 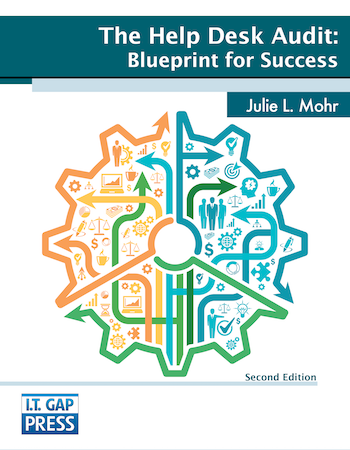 It begins with understanding how your organization works today. 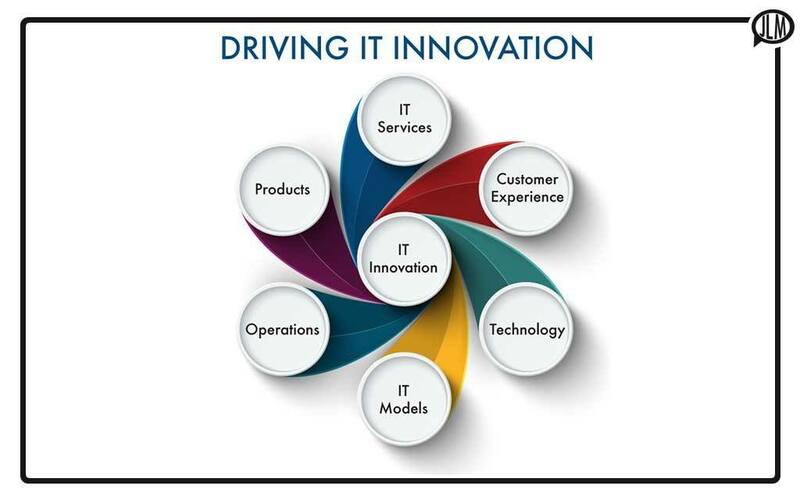 Most IT organizations work in established patterns. The work spans the spectrum from dynamic conversations to static planning. The activities of the organization can take seconds to years. While the executives desire to drive innovation, the organization is tasked with time-consuming operations that do not translate into the desired business results but are necessary to serve the customers. The transactional work, while necessary, consumes time and resources that should be working on more value-added work such as development projects and strategic planning. To drive change in organizations and to create change, the organization must identify ways to disrupt the traditional models to pave the way for innovation. One path to encourage innovation is to identify ways to reduce transactional work and provide more opportunity to work on projects and planning activities. 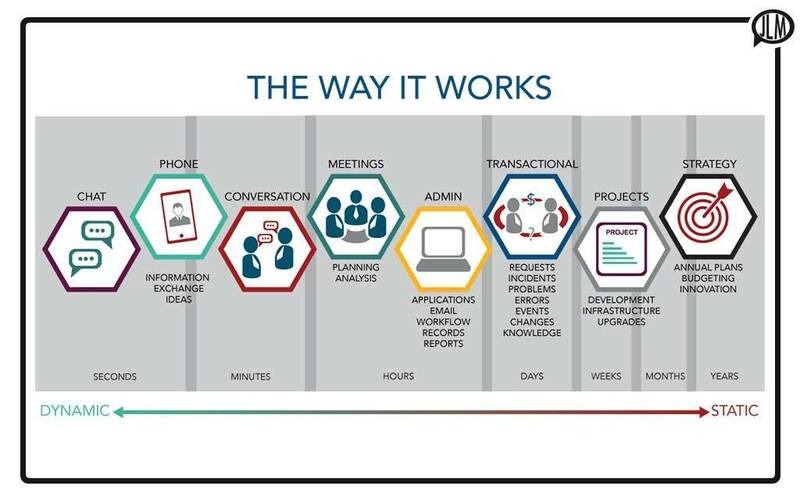 Requests, incidents, problems, errors, events, changes, and knowledge represent the vast majority of transactional IT work that consumes resources. 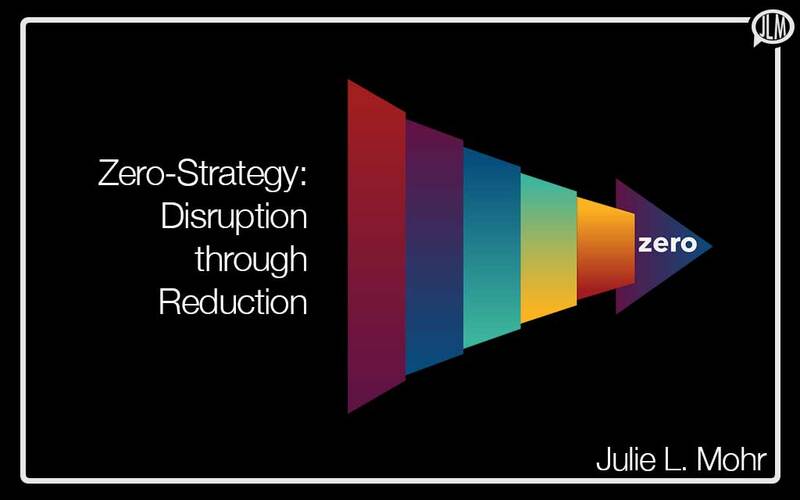 A Zero-Strategy is not a method to push our customers away but instead is a mechanism to disrupt our current ways of thinking to drive change and innovation. The organization must strike a balance between meeting customer expectations, while also identifying ways to reduce transactional work in positive ways. The IT organization captures a wealth of information about our customers and how the customers use our products and services. Often, however, that information is “owned” and “managed” by different functional units with different agendas and strategies. The captured data can unlock the gateway to innovation if driven strategically across the functional silos with the goal of creating real change for the business. The solution begins with capturing better data, processing the data in meaningful ways that allow the IT organization to understand the tensions between the different functional areas so that we can improve the overall outcome to the business. For example, incidents impact the business. The IT organization focuses on restoring the service to get the business back up and running as quickly as possible. If the IT organization is proactive, then error identification and removal are also priorities – if the service does not break in the first place, then the customers don’t need to report the incidents. The errors are identified in incident or problem management and then resolved through change management by submitting a request for change. If the changes are not completed correctly, failed changes result in incidents. The three processes: incident, problem, and change – are in tension with one another. Tasks completed in one process can have a direct impact on the other processes. When processes are measured and managed in isolation, it often results in improvements in one area and issues in another. A Zero-Strategy, where everyone is working together to identify how to work smarter not harder can create dramatic change by evaluating the bigger picture and disrupting our established work methods. Prioritize Incidents: Resolve high impact issues as quickly as possible to eliminate impact and more incidents being reported. Incident Ownership: Own incidents through resolution, reduce mean time to resolve, and prevent status callbacks. Incident Categorization: Identify unreliable infrastructure and make repairs. Analyze Incidents: Identify ways to improve existing business services in alignment with identified needs. Capture Knowledge: Use knowledge to provide self-service to customers and improve call deflection. Design Better Products: Use knowledge to assist development teams in improving products that don’t fail in the first place. Training: Trained staff and end users to reduce how-to calls. Proactive Communication: Status updates via the IVR, alerts, and notifications to notify customers of issues and expected resolutions to improve call deflection. Trend Analysis: Identify errors through analysis of trends in incidents and problems. Root Cause Elimination: Identify and remove errors in the infrastructure. Prioritize Problems: Focus on the problems that are creating a significant impact on the business. Capture Knowledge: Drive improvements in products and services and identify opportunities to innovate. Develop Change Models: Create workflows for commonly occurring changes to improve consistency, manage risk, and reduce time to implement. Automate Change Models: Automate defined change models through workflow management tools to reduce risk and improve governance of changes. Shift Low-Risk Changes Left: Move low risk commonly occurring changes with defined change models to request fulfillment. Improve Testing: Identify change risk before implementation and deploy risk reduction or elimination measures. Better testing will provide the value of the change while reducing incidents, disruption, and rework. Track Changes: Track all changes and identify undocumented changes to improve change policy compliance. Build Releases: When changes are bundled into releases successfully, this will eliminate downtime for the business and reduce the impact of isolated, repetitive changes. Develop Request Models: Create request models or predefined workflows/templates for commonly occurring requests. 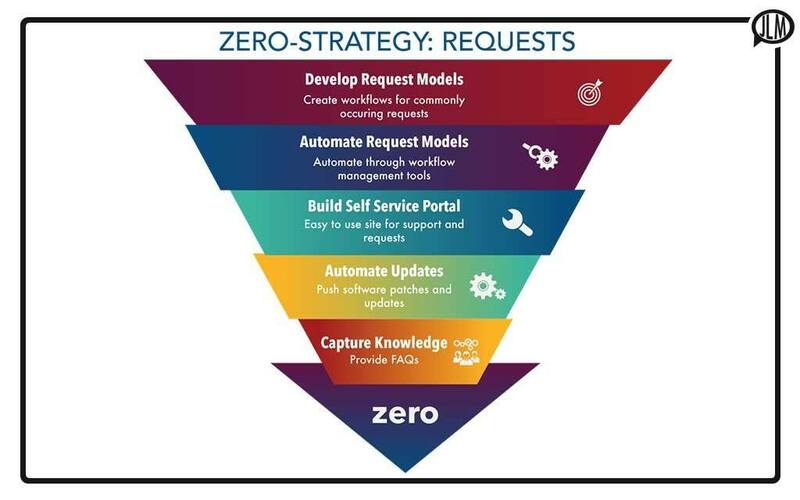 Automate Request Models: Using workflow management systems, automate request models to reduce dependency on resources. Build Self Service Portal: Build an easy-to-use site for support and requests that will reduce friction for customers to access available services. Automate Updates: Push software patches, purchases, and updates directly to the device. Capture Knowledge: Provide available knowledge captured in the incident and problem management workflow directly to customers in the form of a knowledge base, documents, and FAQs. Auto Recovery: Another significant reduction method is auto recovery tools that allow end users or support staff to return a customer to last known steady-state. Capture Knowledge in Customer Context: Improve the findability and usability of knowledge in self-service. Shift Knowledge Left: Improve productivity of staff by moving knowledge closer to the customer. Improve Products and Services: Use knowledge to improve existing services through error removal. Drive Innovation: Identify new products and services. Leverage Knowledge: Drive innovation through artificial intelligence and bots. The Zero-Strategy approach will improve how the IT organization works. However, the focus on reducing transactional work where ever possible without impacting the quality of services or customer satisfaction is also a great way to drive innovation and get the organization out of its comfort zone. The ultimate goal is to simplify the way the organization works and drive greater efficiencies and better alignment with the business direction. 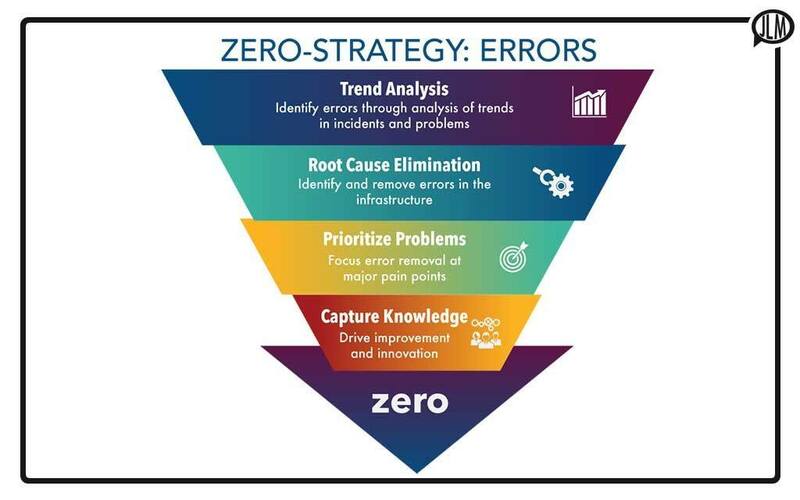 A Zero-Strategy begins by analyzing the data you have today; improving the way the information is captured, stored, and used; and improving processes and technologies where needed to ensure adequate results. Your organization must develop analytics that focuses on finding ways to simplify work, improve customer relationships, and better align services with the business needs. A Zero-Strategy will encourage a forward-looking organization by analyzing the past, enable data-driven business decisions, and drive competitive advantage. IT staff invested in reducing transactional work to free up time for higher value-added work will open the door to creative ideas and help your organization to discover unexpected business opportunities and organizational improvements at all levels. The goal is not to reduce the transactional work to zero, but to develop an attitude of continually searching for ways to reduce the volume. Hopefully, we can set aside traditional methods and models that have existed for decades and develop new and innovative ways to serve our customers. The strategies presented here only begin to scratch the surface of possible methods to reduce transaction work. If you have a creative spark, an innovative idea on how to drive down transactional work while still maintaining high-quality services and improve customer satisfaction, please let me know! Let’s continue to drive innovation in the industry! This article was originally published by HDI Support World, 20 April 2018.